I watched the color drain from my son’s face, watched his body tense and his eyes lose a little sparkle. It was agonizing, and all I could do was listen. I knew this about his friend, have addressed it several times with both boys, even the “friend” in this instance. He is the equivalent of a human anchor that can drown my sons even in the shallowest waters. I ask him repeatedly to stay away but he always comes back and drama ensues…today is perfect proof. I watched my son physically battle the anger and frustration and disgust and betrayal. Every inch of his body reflected the emotion coursing through his mind and his heart. He lost a little something today and I saw it happen…it’s one of the hardest events I have ever witnessed or been a part of. My heart aches as I watch my son. I’ve slacked a bit in getting these assignments done, but decided that contrast is an easy topic for me. A little fun and yes, I admit, I’m cheating on this one!! There are two dimensions in which I have lived my life, the North and the South. Being a true Mainah, there are so many elements about Maine and New England that I truly love. However, having spent time in North Carolina, there are too many elements of that lifestyle that truly overpower the Mainah in this country gal. The only way to describe it is with pictures…two pictures, that is all it will take. Picture 2 is taken in Berwick, Maine in my front yard after 1 snowstorm that was thirty two inches of the horrid white stuff! Mind you, I have grown up in cold weather but never, at any point in my life, have I been a fan of this cold weather! My family, ie boys, on the other hand love it and were in the throes of building a huge fort. The contrast is that my heart and soul love and need the warmth and energy that the sun brought to me on a daily basis. I was literally warmed to the core while taking leisurely strolls daily along the beach. I miss the south immensely but understand my family never feeling it could be considered home. 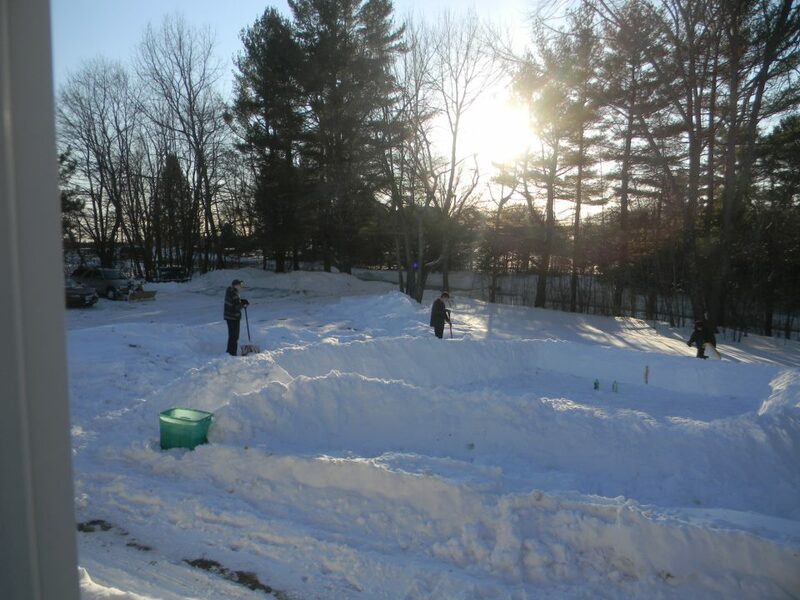 At the same time, with snow abundant in our part of southern Maine, I would not trade a second of seeing my boys happy and active again, getting out of the house, rounding up the crew and building a snow fort or lighting a bonfire or heading to someone’s house for a pool party. They say home is where the heart is, and when it is in two places at once, contrast is the perfect word I would use to explain it. As a mother, my heart loves the warmth and sunshine and crashing waves and year round lifestyle I was able to live in North Carolina…and at the same time, none of that is worth it if my boys are not right there with me! All the warmth and color in the world mean nothing without their laughter and smiles, hearing them whisper in brother code behind a closed door, or watching them walk out each morning and hearing them greet me. Contrast … yup, this is mine!!! Already it appears a good thing is happening for T. Looking forward to shared adventures and tales!! As with any endeavor or new career choice, networking is a huge part of the process. Not only do you meet your local owners, businesses, etc, you meet the local market and culture. Having spent five years in staffing and recruiting, networking was a regular part of my position…bonus points that I got paid to go and mingle, attend after hour dinner parties and speaking engagements, meet the local companies and business owners. Bonus that in meeting those folks, I was building relationships, finding common ground, sharing stories, hearing how companies had been done wrong by other agencies and having the opportunity to fix those errors…I did well in this field and loved every minute of it! So there it is … Hello to my neighbors. I’ve read and continue to read your blogs. I can relate as a mom, wife, sister, woman, person, coworker, writer…whether it is shared music, shared ideas, shared feelings, my world is expanding and blogging has been a big piece of that. While time management is a huge part of my day to day, getting home to clean the house, cook a meal, do those dishes, be a mom, drive my son to work, etc takes a toll on my available time. My mind spins constantly with thoughts and ideas, and I find that not getting them down in writing means I lose them, or the thought becomes less focused and directed as it appeared when it was originally running wild and free through my mind. Finding time for me and for writing is by far the toughest assignment I face every day! I know that about myself and am working on it, so please bear with me! That being said, my real focus these days is the transition my entire family is going through. I’m the one person that works and provides full time support to my house. My husband works part time…”and that’s all I have to say about that!” My oldest son is working on getting his truck fixed, just began a new full time position as a laborer/apprentice in a machine shop, and my youngest son goes to school full time and works almost full time. My boys are on the brink of creating that next chapter, taking that next step, and that is where my heart and mind run full bore wide open all the time. Getting them to that next place/step is forefront at all times…doing whatever it takes to make their transition into life one level smoother. I want them to move forward with money in their pockets, self earned money but money just the same…my parents were unable to pave the way for me, and I am in the same boat with my own kids. I see that as having failed them though I was able to provide the rest of the skills to make them successful “contributing members of society.” I don’t know…my thought train just jumped off the tracks…15 minutes is up thank goodness! Oh my goodness! Being as sarcastic as I am with a small touch of naughty, say my name is a little more than I wish to exclaim on my blog. However, I get the theory…how will I be found if you don’t know who I am. My blog is already on the money for me, so I don’t feel the need to make changes to that piece of information…Kathylynn Bentz by day and to most of the world, Maine Mama to those who know my online voice and personality. Is change part of my journey? Absolutely, but do I wish to make that change just now…I don’t think so! My title line and caption will remain the same as it is true to who I am. I never know who or what might strike my fancy, when my intended message may jump into a book or some interesting facts, or when my brain may be a bit scattered and the reader finds a round of chatter. This is true to who I am…no title changes or subtitle changes are required. However, in line with the Say My Name assignment…I can say that I was instantly reminded of the Destiny’s Child song. “Say my name, say my name…if no one is around you say baby I love you, if you aint runnin’ games!” A little pop culture from when the kiddoes were small and coaching cheer clinics took the better part of a summer!! !